WILLEMSTAD - Balance of payments developments. According to estimates of the Central Bank of Curaçao and Sint Maarten, the deficit on the current account of the balance of payments widened in 2016 compared to 2015 as a result of a drop in net exports of goods and services and a worsening of the income balance. By contrast, the current transfers balance improved. The decline in net exports was caused by a decline in exports, mitigated by lower imports. Exports contracted because of, among other things, a decline in foreign exchange earnings from tourism activities due mainly to the poor performance of cruise tourism in both Sint Maarten and Curaçao. Furthermore, foreign exchange receipts from stay-over tourism contracted in Curaçao, caused primarily by the decline in the number of Venezuelan tourists. The situation in Venezuela caused also a drop in the foreign exchange earnings from air transportation services and the re-exports by the free zone in Curaçao. Moreover, foreign exchange revenues from bunkering activities shrank, reflecting largely the lower international oil prices and increased competition from the region, particularly Colombia, Trinidad, and Jamaica. The lower import bill can largely be explained by lower oil imports as a result of the decline in international oil prices. Moreover, merchandise imports by the free-zone companies in Curaçao continued to drop. The income balance worsened because of a decline in interest income received from abroad combined with more interest income paid to abroad. Meanwhile, the current transfers balance improved supported by a rise in current transfers received from abroad, moderated by more current transfers paid. In line with the development on the current account, external financing into the monetary union is projected to rise. The increase in the external financing reflects a worsening of the portfolio investment, direct investment, and loans and credits balances. The worsening of the portfolio investment balance can be explained by, among other things, matured foreign debt securities held by institutional investors that were not entirely reinvested abroad during 2016. Furthermore, the issuance of bonds by the government of Curaçao that were purchased entirely by the Dutch State contributed to the worsening of the portfolio investment balance. Meanwhile, the direct investment balance deteriorated mainly because of increased claims of foreign direct investors on their subsidiaries in the monetary union. The loans and credits balance worsened as a result of, among other things, a decline in foreign deposits of residents of Curaçao and Sint Maarten. Also, the net trade credits balance deteriorated as a result of the net repayment of trade credit extended to foreign customers, mitigated by the repayment of trade credit received in the past on imports. As the external financing exceeded the current account deficit, the gross official reserves of the Bank increased in 2016 by an estimated NAf.155.0 million, more pronounced than the NAf.27.8 million increase in 2015. As depicted in Figure 5, after five years of a decline, the current account deficit as a percentage of GDP in the monetary union rose again from 10.6% in 2015 to 12.3% in 2016. An increase in the current account deficit caused primarily by a decline in exports point to competitiveness problems, which need to be addressed in both Curaçao and Sint Maarten. Meanwhile, the external financing as a percentage of GDP rose from 9.8% in 2015 to 13.2% in 2016, reflecting increasing liabilities to the rest of the world which eventually will have to be paid back. 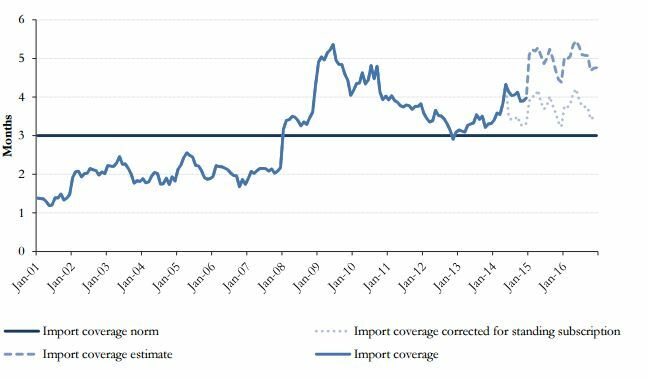 As shown in the figure above, the import coverage increased from 4.4 months in December 2015 to 4.7 months in October 2016 as gross official reserves rose, while imports dropped. However, if corrected for the inflow of funds related to the bond issuances by the governments of Curaçao and Sint Maarten, the import coverage would have been 3.4 months in October 2016. Although the import coverage would have remained above the 3-months benchmark, it can be concluded that the economic performance of the monetary union alone is not leading to a sustainable improvement of the balance of payments. During the first quarter of 2016, the Bank continued to direct its monetary policy at reducing the surplus in the money market through the auctioning of more Certificates of Deposit9 (CDs) while keeping the reserve requirement percentage unchanged at 18.00%. 10 However, due to a policy change effective March 1, 2016, whereby commercial banks under the emergency rule are exonerated from the reserve requirement, the required reserves fell during the first quarter of 2016. As of the second quarter of 2016, the monetary policy instruments of the Bank were deployed neutrally. Consequently, the reserve requirement percentage was kept unchanged at 18.00%. Meanwhile, at the biweekly auctions, the Bank aimed only at the refinancing of maturing CDs. Up to June 2016, loans extended to the private sector rose by 1.9% on an annual basis in the monetary union. In Curaçao, private credit extension increased by 0.6% compared to June 2015, resulting from an increase in business loans (3.1%), mitigated by declines in mortgages (-0.8%) and consumer loans (-0.2%). Meanwhile in Sint Maarten, the amount of private sector loans outstanding was up by 5.7% due to increases in business loans (9.1%) and mortgages (6.6%). By contrast, consumer loans dropped (-1.5%). The deficit on the current account of the balance of payments will widen in 2017 primarily as a result of a decline in the net export of goods and services. In addition, the income and current transfers balances will worsen. The net export of goods and services is projected to decline because of an increase in imports, moderated by a growth in exports. Imports will rise as a result of, among other things, an increase in oil imports driven by higher projected international oil prices. Furthermore, merchandise imports will increase because of, among other things, more imports of construction materials related to the projected investments for 2017 in both Curaçao and Sint Maarten. Also, merchandise imports by the wholesale & retail trade sector will go up on the account of higher domestic demand and more tourism spending. The higher exports will be sustained by an increase in foreign exchange earnings from bunkering activities as a result of the higher projected international oil prices. Furthermore, foreign exchange earnings from tourism activities in both Curaçao and Sint Maarten will increase, in line with the projected real GDP expansion in the main tourism markets. By contrast, the foreign exchange earnings from refining activities in Curaçao are projected to drop as the Isla refinery might gradually reduce its operations and investments as the lease contract will expire in 2019. The external financing is projected to surpass the deficit on the current account. Hence, the gross official reserves will rise further, albeit at a slower pace compared to 2016.